Striders, Behemoths, and Stormbirds might populate most of Horizon Zero Dawn’s world, but once there were much smaller, fluffier creatures. Despite the fact that they’re most definitely extinct by Aloy’s time, they’re not entirely absent from the game. On your journeys you might stumble upon one of the six animal figurines scattered around. They’re remnants of a bygone age, bronze statues of the animals that we know so well. 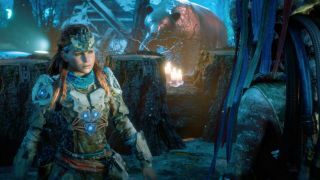 Find all of them and you’ll get some nifty rewards - so to help you along the way here’s the locations of each animal figurine in Horizon Zero Dawn: The Frozen Wilds. Make your way towards the ruined lodges by the control tower (which you’ll want to either destroy or override if you’re feeling especially peaceful). Right next to the tall robotic flower (on it’s eastern side if you want to get real specific) is a ruined fireplace made of stone. Inside it you’ll find the first animal figurine, which so happens to be a statue of a majestic moose. Run to the eastern side of the river that emerges from the Dam. Go to the southernmost ruined building (the one with ruined iron railings across a window on the northern side if you want to get really specific). In the empty doorway on the western side of the building you’ll find the second animal figurine. It’s a courageous cougar. Head towards the ruins in the Charger site. If you don’t fancy sneaking around, you’ll either want to override the robots...or kill them all. Your choice. Once you’re done with either option, run to the brick ruin that’s half-filled with red grass. The statue is in an empty window on the western side of the building. This time it’s a beautiful bronze bison. After you’re done talking to Ourea - you’ll need to get to this point in the main quest to get this far - run to the eastern side of the room where you do the source node puzzle. The figurine is on a desk, and it’s a glorious grizzly bear. Go to the area which you backed the drone into. Jump up on its wings, then leap to the platform on the southern side with the half-ladder leading up to it. There you’ll find the figurine, which is a stunning stag. Location: At the arch that marks the entrance to Yellowstone National Park, east of the control tower that’s on the south eastern side of the map. If you run directly east of the control tower, you’ll soon stumble upon a massive arch that used to mark the entrance to the Yellowstone National Park. Run into the room on its northern side and you’ll find the figurine - a wondrous wolf. Now that you’ve got all six of the figurines, head to the two colourful hot springs at the Trampler site. Once you’re there, run south west until you get to a semi-ruined wooden lodge. In it you’ll find a special merchant. This Banuk Shaman is called Enjuk and he’s fascinated by these bygone animals (try not to dwell on their extinction too much, or you’ll get all sad). Give all the figurines to him, and you’ll make the holograms of Yellowstone’s lost creatures come to life - along with a booming description of them narrated by Montana Recreations that’s liable to make you jump out of your skin. Enjuk will give you some nifty treasure boxes as rewards too, whose contents will undoubtedly come in handy.